Birmingham’s Cahaba Brewing Co. features a microbrewery and tasting room in the historic Continental Gin in East Avondale. Birmingham has emerged as a bit of a craft beer mecca, not only for Alabama but for much of the region. While brands such as Good People and Avondale often tend to dominate discussions of Birmingham beers — in part because they are more widely distributed than some of the city’s other brewers (and also because they are pretty good) — one shouldn’t overlook some of the other selections the Magic City has to offer. Cahaba Brewing Co. was founded in 2011 in Birmingham’s Lakeview District and operates a modern industrial taproom on 5th Street. 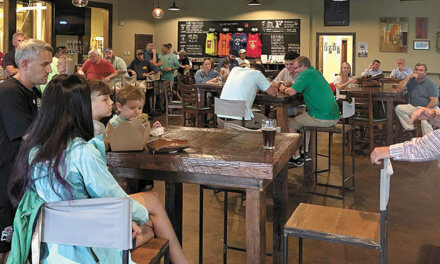 Cahaba puts out a half-dozen year-round styles, plus occasional seasonals and specialty beers, but are currently available only in Central Alabama. I picked up a six-pack of its flagship American Blond Ale while passing through Birmingham. It was good, although very light — more like a lager than an ale. 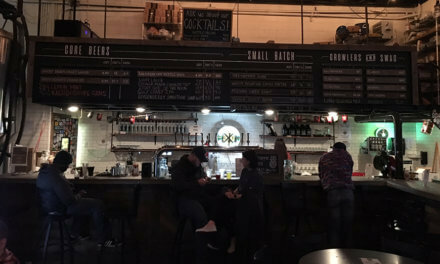 Another smaller Birmingham brewery that, as of right now, does not have a footprint in South Alabama is the Ghost Train Brewing Co. Also situated downtown, on 3rd Avenue, it puts out five styles — a lager, a golden ale, a brown ale, an “IPL” (India pale lager) and a kettle sour. I tried both its Craft Lager and Kaleidoscope Kettle Sour, and came away impressed. Both were relatively light, but flavorful. The lager had some good hop notes, while the Kaleidoscope was tart with some berry flavors, but neither too sweet nor too sour. If you’ve been wary about trying a sour beer, this would be a good one to dip your toes into, if you can find one. Trim Tab Brewing Co., on the other hand, has moved into the Mobile market, with some styles readily available in cans in our area, including its IPA, which I found at my local Publix. It was not bad, but was very bitter, even for an IPA. Another Trim Tab style available here is the awkwardly named Paradise Now Raspberry Berliner Weisse, a light wheat ale, with — you guessed it — raspberry flavors. It was very nice, acidic and the notes of fruit were subtle; I almost wished there was a bit more of the raspberry flavor. It will be a great beach beer once the spring breakers leave and we can enjoy the shore. The Trim Tab brewery and taproom is located in in the Southside section of Birmingham, not far from UAB, on 5th Avenue. It’s in a very cool space — an industrial warehouse, with the actual brewery in the front and the taproom in the rear. The taproom had a DJ and disco lights, with “The Wiz” playing on the big screen the Friday night I was there and food trucks in the courtyard outside. There were seven beers on tap, most of which are only available in the taproom, plus some more styles available in bottles and cans. It’s a neat spot to either stop by for a beer or spend an evening. If you’re in Birmingham this weekend, Trim Tab will be celebrating its fourth anniversary April 13-14, with music and a number of small-batch beers, the release of a special anniversary beer in cans and a pig roast. It sounds like a good time!